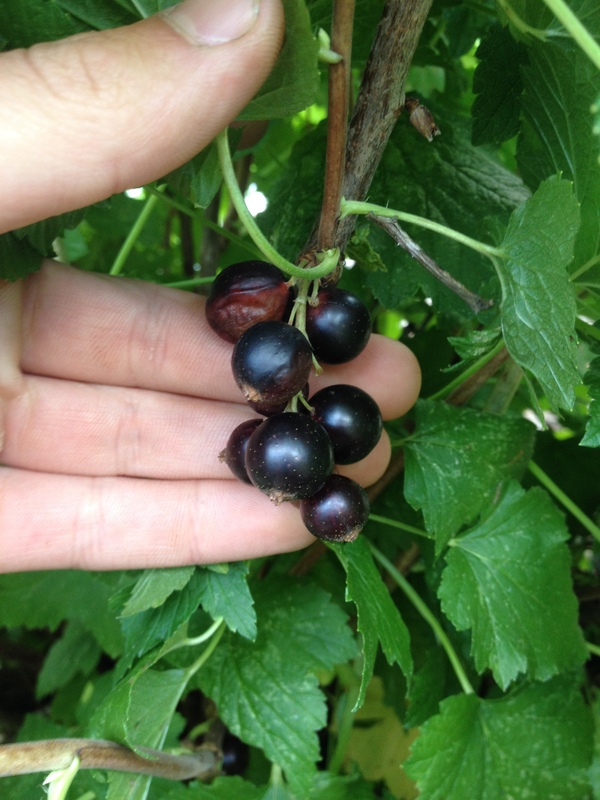 Upon first taste black currants fascinated my palate and they’ve succeeded in doing so ever since. Over the years I’ve increased my collection to a dozen or so varieties. With white pine blister rust being a prevalent issue in Michigan my selection criteria has been narrowed down to only varieties which exhibit partial or full resistance to WPBR. I started with Consort and since then the collection has grown to include Crusader, Titania, Blackdown, Minaj Smirou, Ben Sarek, Belaruskaja, and various others that aren’t bearing yet like Kirovchanka, Vertti, Otelo, and a few that aren’t coming to mind. 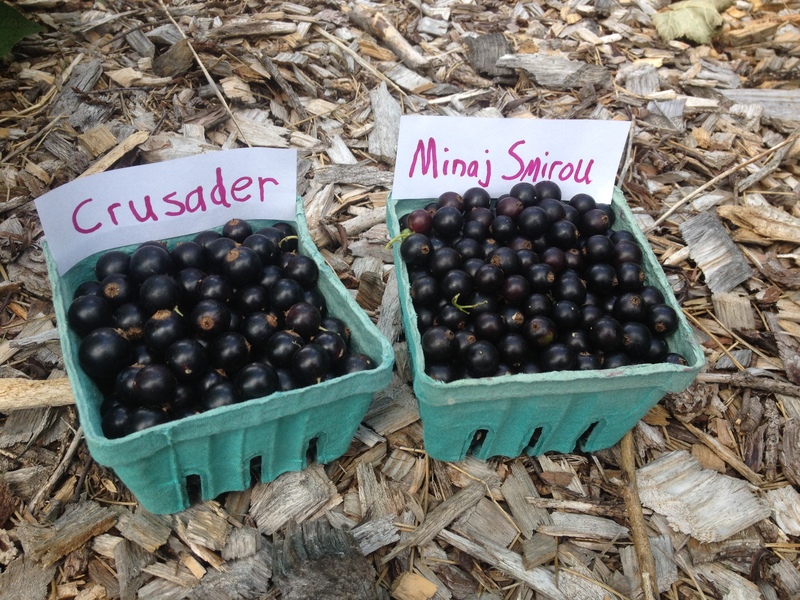 Large shiny jet black berries of Crusader. Crusader was an early introduction from the Central Experiment Farm in Ottawa, Canada. It was released in the 1940’s as a rust resistant variety for North America. For me it has been a very consistent producer of medium sized fruit. They tend to be thicker skinned and very sharp(high acidity)…not one of my favorite for eating out of hand but still enjoyable, especially when dead ripe. Crusader holds onto its fruit for a long time and the thick skin slows down their perishabilty which is a nice quality. The bush itself, like all of the others developed by A.W.S. Hunter, is upright and open compared to some of the more dense varieties, particularly those from the Scottish Research Institute. Consort was released from the Central Experiment Farm to replace Crusader as a commercial variety in the 1950’s. Why, I’m not sure…as I tend to prefer Crusader. Consort fruit are small and relatively poor quality in my opinion. They’re sharp and have that characteristic ‘musky flavor’ but lack depth and seem inferior to Crusader. Consort does produce long strigs that tend to ripen pretty evenly. Consort is entirely WPBR resistant. Coronet is another one from the Canadian breeding program that I’ve yet to try. Titania is a Swedish variety that was developed in the 1980’s using Consort as one of the parents. This is the first season I’ve had a substantial crop from Titania and so far it seems similar to Crusader and Consort both in fruit quality and bush form. It was very productive this year and is a vigorous grower; thus far it seems rather quick to mature compared to other cultivars that have been in the ground 1,2, and 3 years longer. Titania is reliably resistant to WPBR. 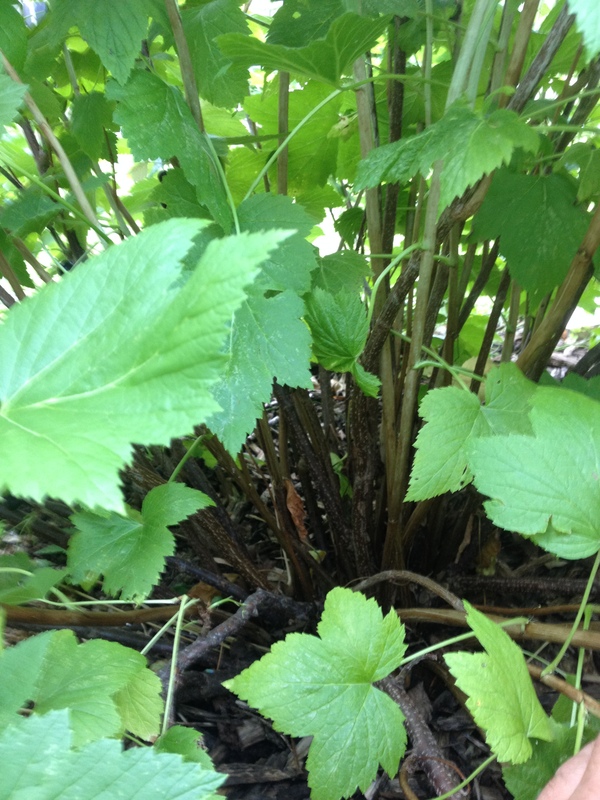 Stem density on Minaj Smirou…always have to remind myself to prune more than less because of its vigorous nature. I haven’t been able to find much information about this variety besides that it was developed in Bulgaria and is a more recent introduction. This has been hands down the most productive variety for me. Also the most vigorous grower that requires aggressive pruning. The branches tend to lodge when holding big crops and are more laterally dominant than varieties like Consort and Titania (conducive for layering). The berries ripen over a long period starting early in the season (need to take more notes on ripening times*); generally its the first to ripen here. 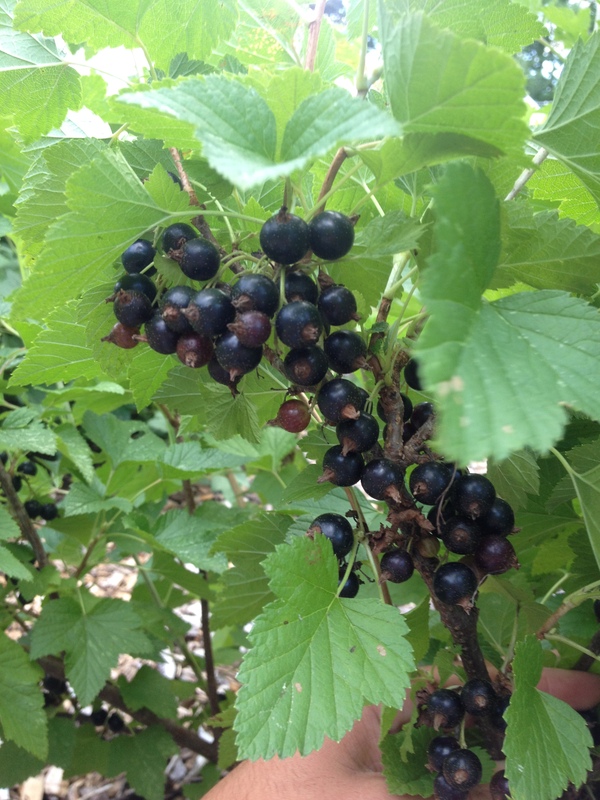 This is a great variety for somebody new to black currants or for the more tamed palate as it is very mild. Thick skin can be a turn off for some folks, Minaj scores well in this department with the thinnest skin of all. It lacks the tart punch that almost all black currants have which makes it nice for eating out of hand. However, if you’re after that traditional black currant flavor than Minaj is probably not for you. I enjoy the berries because they ripen first and I always realize its blandness when compared to some of the later ripening cultivars. Minaj is reliably resistant to WPBR. I know— 5th grader hand writing, maybe worse. Blackdown is an English variety that is reportedly not 100% rust resistant, however its never showed any signs in my trials. 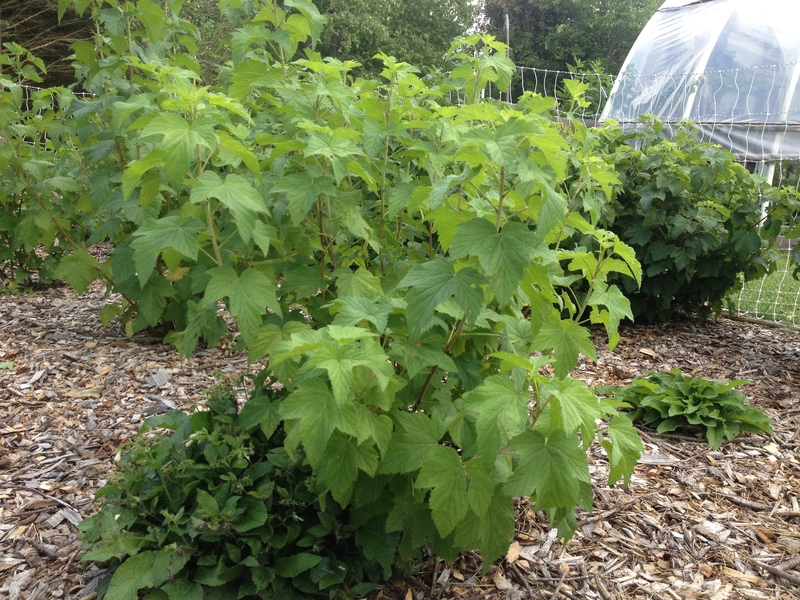 The bush is more compact than most with very close leaf nodes making the canopy dense. So far it has been a little less productive than the other varieties but produces the highest quality fruit in my opinion. The flavor of blackdown is outstanding– they have the same acidity thats common with varieties like Crusader except they’ve consistently had a higher sugar content which really supports the sharpness and makes for an overall more pleasant mouth experience. The berries are medium sized with moderatly thick skin. Higher sugar content would make Blackdown more acceptable for the average American palate I think. I am going to plant a lot more of this variety because I like it so much. Ben Sarek is very compact and good for small spaces. Large berries and signs of the unusual rot that hits even unripe berries sometimes. Any insights? 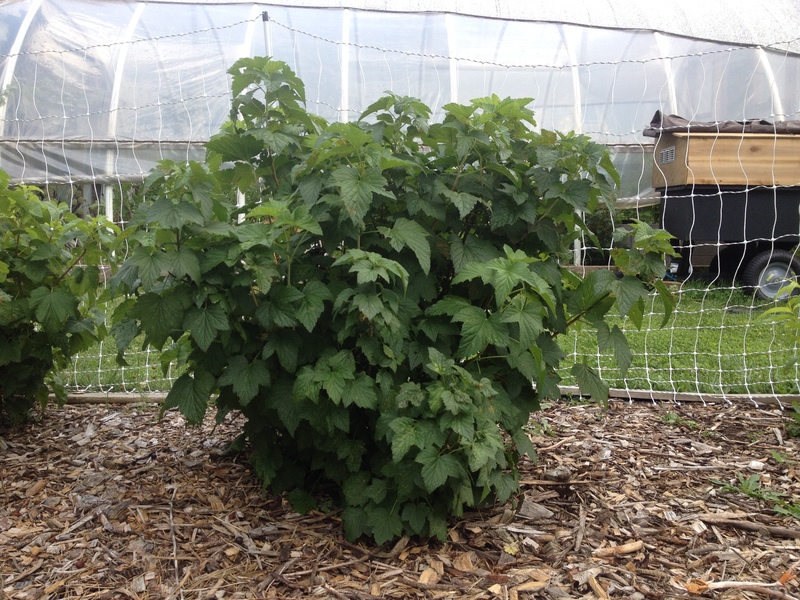 All varieties with Ben in their name come from the Scottish Research Institute. Ben Sarek is a more compact plant making it nice for the home garden. It bears resemblance to Blackdown in bush form and holds its berries in tight clusters. For me it has been only moderately productive. The berries are larger than all of the other cultivars and tend to have a unique flavor that I’ve yet to figure out. Less complex and less tart and almost a mild dirty flavor…as if they’re slightly rotten. It also gets this weird rot where the berries become very soft with an unagreeable flavor, unlike any other cultivar. Aside from the compact nature and large fruit size Ben Sarek doesn’t have much going for it. It is partially resistant to WPBR but has never shown signs in my trials. 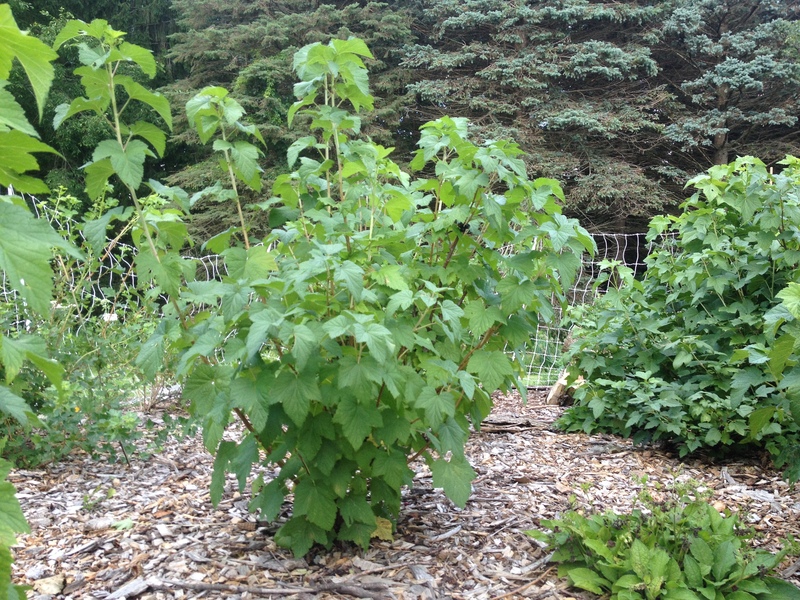 Young Belaruskaja with dwarf comfrey. This is a variety I added to my collection per request from Lee Reich and I’m happy I did. I planted it in the spring of 2013 and cut the bush back to a few buds and it put on considerable growth last season and set a small crop for this first time this year. 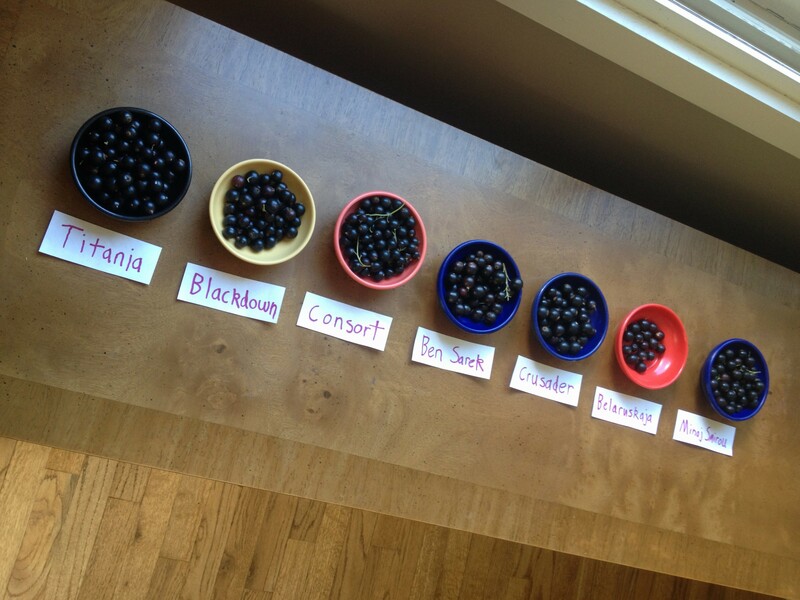 The berries are somewhere in between Blackdown and Titania in flavor with a nice sweetness as described with Blackdown. So far I’ve only sampled a few dozen of these and look forward to further evaluation. I see good prospects for Belaruskaja as a premier fresh eating variety. It has been a joy to compare these different varieties and if it weren’t for the diversity than the contrast would be minimum and there wouldn’t be much to judge against. I hope to pay closer attention in future years to ripening times and pest resistance, primarily regarding currant borer and aphids. Also, further experimentation in the kitchen will prove which varieties are best for cooking, juicing, etc. 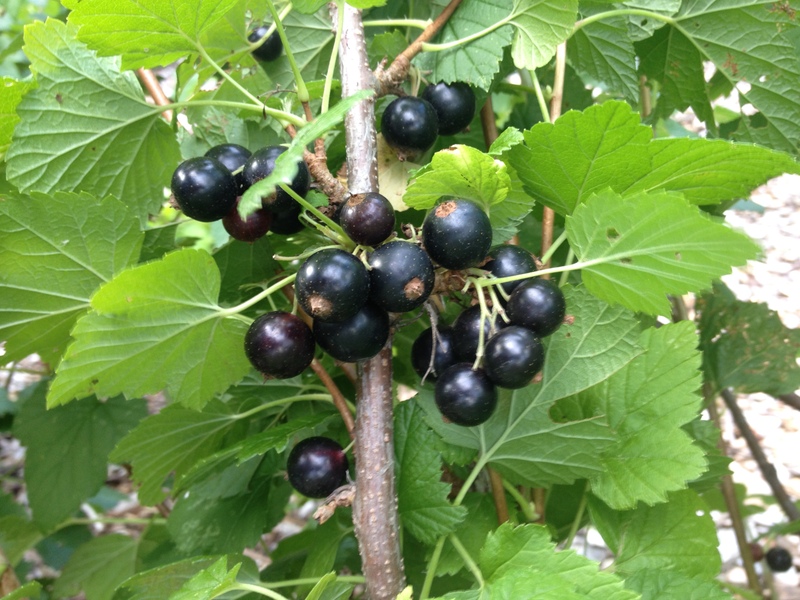 All in all black currant has been one of the most successful, less-maintenance fruits in my gardening experiments.